Bleed Eagles Green: Philadelphia Eagles Blog: A What? 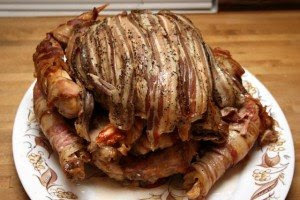 A TURBACONDUCKEN?!? Eagles' fans have always yearned for a Thanksgiving home game. Well tomorrow our wish is granted. The tailgating options are endless. 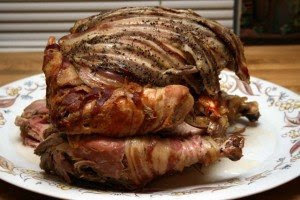 The obvious choice might be the classic Turducken. Always a good selection, but when compared to the new Turbaconducken (Turducken Wrapped in Bacon), well there is no comparison. Enjoy, but just don't get too full. Gotta have some energy left to let Reid know how much we appreciate him! It's a feast for Andy! !